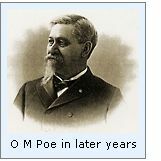 Orlando Metcalfe Poe was born on March 7, 1832, in Navarre, Ohio. Entered the U.S. Military Academy in 1852, he graduated sixth in his class in 1856. Poe attained the rank of First Lieutenant while appointed to the position of assistant topographical engineer on the survey of the northern Great Lakes from 1856-1861. With the outbreak of the Civil War, Poe assisted in organizing the Ohio volunteers, and later became a member of General McClellan's staff, in which capacity assisted in organizing the defenses of Washington D.C. against the Confederate forces. On September 16, 1861, Poe attained the rank of Colonel, and was placed in charge of the 2nd Michigan Volunteers. Poe went on to command this regiment successfully during both the Peninsular and Maryland campaigns, and was commissioned as Brigadier-General on November 29, 1862. He later served as chief engineer of the XXIII Army Corps in the capture of Confederate forces occupying Knoxville, Tennessee. Poe then assumed the position of Chief Engineer of the Army of the Ohio, and successfully directing the defense of Knoxville against Confederate General James Longstreet's forces. 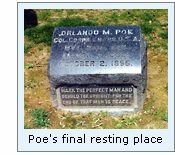 Poe's continuing success was not going unnoticed, and General W.T. Sherman selected Poe as his Chief Engineer in April of 1864. Under Sherman's orders, Poe "thoroughly destroyed Atlanta, save its mere dwelling-houses and churches." The destruction was by fire purposely applied to buildings, and permitted to spread, as was expected, from house to house until the defenseless city was almost entirely reduced to ashes. No efforts were made to prevent the spread of the conflagration, and scarcely any structure was designedly spared. Only about 450 buildings escaped this ruthless burning, among them many churches, which in those days generally stood apart from other buildings. The thoroughness of the destruction can be realized, when we consider that by the census of 1860 Atlanta had a population of 10,000, which in 1864 had increased to 14,000. More than 4,000 houses, including dwellings, shops, stores, mills and depots were burned, about eleven-twelfths of the city. Capt. 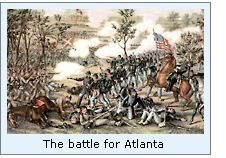 Daniel Oakey, of the Second Massachusetts volunteers, reported "Sixty thousand of us witnessed the destruction of Atlanta, while our post band and that of the Thirty-third Massachusetts played martial airs and operatic selections." Sherman honored Poe for "gallant services in the capture of both Atlanta and Savannah," and for "gallant and meritorious service in the campaign ending with the surrender of Confederate General Joseph E. Johnston." With the end of the Civil War, Poe assumed the position of Engineer Secretary of the Lighthouse Board in 1865, in which capacity he was charged with the supervision of building projects. In 1870, he was promoted to Chief Engineer of the Upper Great Lakes Lighthouse District. In this capacity, Poe was responsible for all lighthouse construction, and he was largely responsible for the design of a style of lighthouse tower that has become known as the "Poe style" tower. These towers are all tall brick structures, with a gentle taper from bottom to top. All of the Poe designed feature graceful embellishments in the form of masonry gallery support corbels and arch topped windows. 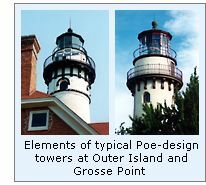 Exemplified by the towers at Grosse Pointe and Presque Isle, all together Poe was responsible for the construction of a number of such towers throughout Lakes Superior, Michigan and Huron. In 1883, Poe became Superintending Engineer of improvement of rivers and harbors on Lakes Superior and Huron, where one of his most important projects was the development of the St. Mary's Falls Canal on the St. Mary's River between Lakes Superior and Huron. Also during this time, on behalf of General of the Army, he provided a brief history of the origins of railroad construction in America to Congress. Poe was also responsible for significant improvements made to the Detroit River and the ship channels in Chicago, Duluth, and Buffalo. Many consider Poe's crowning achievement to be the engineering, design and supervision of a new lock to at Sault St. Marie during the 1890's. This project was instrumental in the development of commerce on the Great Lakes, permitting large ore carrying vessels from mining regions bordering Lake Superior to access the lower Great Lakes and Atlantic seaboard. At a length of eight hundred feet, and with a width of 100 feet wide, the new lock was the largest in the world, and in honor of the designer was named "Poe Lock," a name that it carries to this day. Orlando Metcalfe Poe died in Detroit on Oct. 2, 1895 and is buried in Arlington National Cemetery. There is an interesting side story concerning one of Poe's aides during his time commanding the 2nd Michigan Volunteers. Sarah Edmonson was born in 1841 in New Brunswick, and as an itinerant bible-seller made her way to Flint Michigan. Assuming a male identity under the name Frank Thompson, she volunteered in Company F, 2nd Michigan Battalion under Colonel Poe. Her deception must have been wholly effective, as she took part in the Battles of Blackburn's Ford, Bull Run and the Peninsula campaign. In 1862, she was made an aide to Colonel Poe, and in this position undertook at least two intelligence missions behind Confederate lines "disguised as a woman." She accompanied the 2nd Michigan to Kentucky in 1863, and for as yet undetermined reasons, deserted soon after.